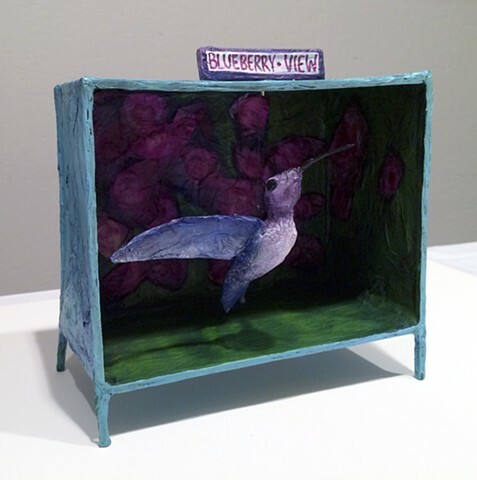 Blueberry View Artist Retreat invited me to spend the last two weeks of August 2014, in Benton Harbor, Michigan, creating art. Living and working in the Michigan Fruit Belt offered me unique experiences and inspired several pieces. On my first morning there, I stood on the porch of the upstairs apartment, photographing the blueberry field next door. In my frame of vision a blur of activity disrupted the shot: an assertive hummingbird greeted me. Curious, she flew within three feet of my face, hovering, with big, black eyes searching mine. She darted around the nearby smoke tree and rose of Sharon, in a feeding flurry, returning regularly to demand my attention. Reliquary for a Hummingbird Encounter celebrates this intimate moment and marks the beginning of what would be a productive stay.